At the first temple I visited, I started talking with someone from Hong Kong who was also there alone. We ended up hanging out for the entire day and along with that, I got my photo taken more rather than just the landscape shots I had been taking. I actually don’t know what this structure is, as it wasn’t one of the temples or shrines I had on my list to visit, it was just one I happened to pass by. If anyone knows, let me know in the comments. This is the entrance to Yasaka Shrine, another one of the most popular shrines in Kyoto. It is well known for Gion Matsuri, a festival during the summer. In the evening, all of these lamps are lit up. I would have liked to be there at the right time to see it. We ate lunch at this small restaurant we came across. No other customers were inside but luckily the food ended up being fine. This is the entrance gate to Nanzen-ji Temple, one of the most famous Zen Buddhism temples in Japan. The famous rock garden was one of the things I wanted to see most, but this section of the temple had a fee to enter. Because I was visiting so many temples and shrines that day and several of them had fees, I decided to pass on entering this part of the temple. You can still look in from outside like the above photo. On the way to the final temple on our route, we came across a big group of cats that just live outside. There were probably 8 or 10 cats we saw while walking. 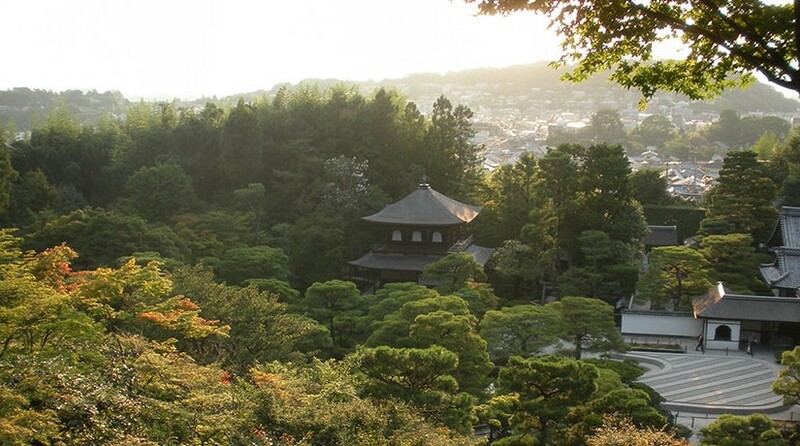 The last temple I saw that day was Ginkaku-ji, a Buddhist Zen temple. It was quite beautiful with the raked gravel and surrounding garden. By this time, I was exhausted and it was getting late in the day. But I had managed to see all of the temples and shrines I had planned on seeing that day, which was a nice accomplishment that just required a lot of walking.